Custom Mirrors: Business Mirror, Gym Mirrors, Dance Studio Mirrors, Beveled Mirror, Tabletop Mirror, Mirror Glass, and more! Supplier and Installation – all shapes and sizes, from full wall, floor to ceiling mirrors to decorative. A distressed window from an 1843 home in Sturbridge, Massachusetts with fresh mirror glass on sale in our shop for $179.00. Custom mirrors and floor to ceiling glass mirror walls add sleek style and elegance at an affordable price. We can custom cut any mirror to meet your needs and provide expert installation if needed. Homes today frequently have personal gym fitness rooms which are greatly enhanced with floor to ceiling wall mirrors. Not only are they great to work out in, an attractive mirrored gym greatly enhances resale value of your home. Need a bathroom, vanity or wall mirror? We’ll make it for you, and we can do so beveled or not beveled... the decision is truly up to you. Both framed and frameless mirrors come in a variety of shapes and sizes, with custom options available. 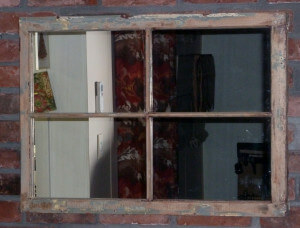 We offer old windows turned into mirrors with a distressed look, very much desired and popular today. We have antique window frames revitalized with mirror glass for sale or you can pick up some old-fashioned window frames on your own which we can turn into very attractive custom mirrors for your home or office. 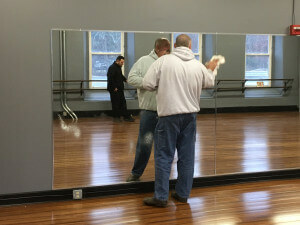 David at Pioneer Glass is making sure the new mirror installed at a dance studio sparkles! There is a growing trend of using instant, designer-style custom mirrors for various places such as your home, office, a fitness center, commercial buildings and other places. Create a mirrored bar to jazz up your entertaining. Spruce up that scratched table with polished mirror glass cut to fit. Pioneer Glass uses only the best quality mirrors and strives to provide customers with the finest product we can get our hands on. We specialize in custom mirrors that fit your room, frame or project perfectly. We can handle any mirror, no size too small or large -- from your bathroom to vanity mirror to wall mirror to home gym. In addition to custom mirrors, we have access to a wide range of stock mirrors that we can order and install for you. 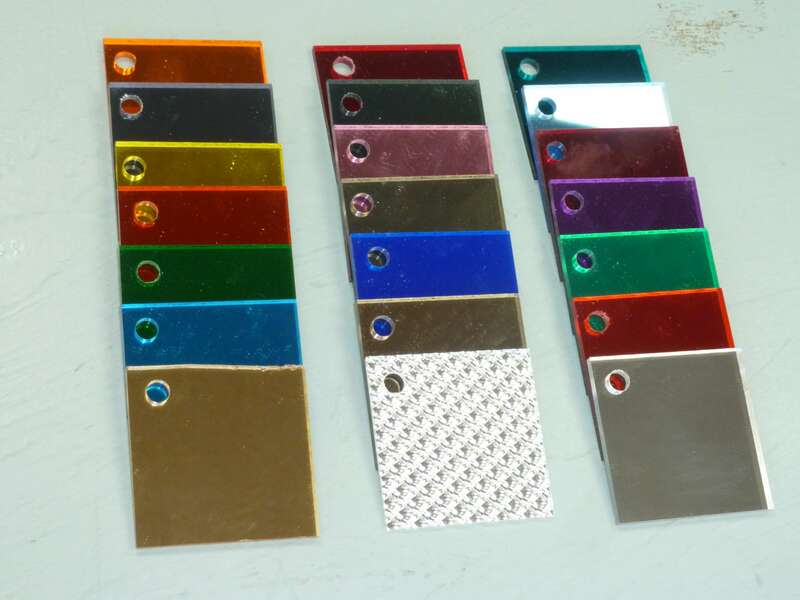 Pioneer Glass can custom cut any size mirror you would like, from crystal clear to more unique mirror glass. New choices include tinted mirror glass, distressed mirror glass, and acid-washed mirror glass. Accentuate your mirror design with these exciting new options. Acrylic Mirrors, commonly referred to as plexiglass mirrors is a lightweight, somewhat flexible mirror that has much better impact resistance than glass mirrors and is very popular in areas where glass would be considered too dangerous. Home gyms, museums, trade show displays, and malls tend to use acrylic or polycarbonate mirrors. We carry a terrific brand of acrylic mirror known as Fabback by Plaskolite. Acrylic mirror is available in a variety of colors to meet any design application. Polycarbonate Mirrors are extremely strong and durable mirrors used where there is a likelihood that glass mirrors will break and cause damage to individuals or animals. We think of polycarbonate mirrors as very muscular versions of acrylic mirrors. Polycarbonate mirrors are used in schools, stables, group homes, and prisons. Polycarbonate mirrors have extreme impact resistance. You can choose beveled or standard mirror glass, with or without hardboard backing and hangers. high polished edge offered with or without hardboard backing and hangers. Pioneer Glass also offers custom antique mirror glass. Cut your mirror in any size or shape in varied thickness and receive a gorgeous antique mirror. Custom Antique Mirror Glass: View what Pioneer has to offer for choices in custom antique mirror glass. An Introduction to Antique Mirrors: What are antique mirrors and how are they made? What types of antique mirrors are there?